This past week the world caught its breath. 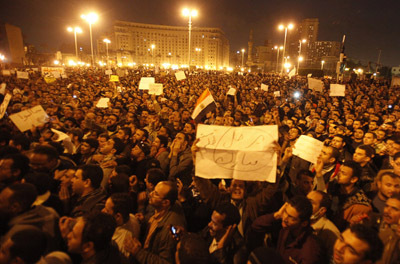 Throughout the Arab world, masses took the streets, and in Egypt the protest movement achieved epic proportions. Thousands if not millions of people invaded the central squares of the country to demand a new government, greater freedom and better living conditions. 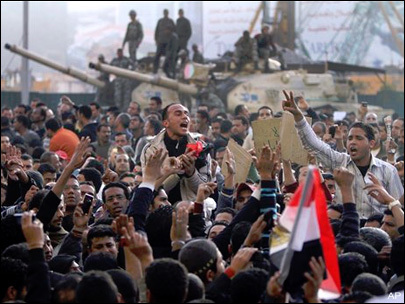 What were inspiring peaceful demonstrations became a nightmare when president Mubarak refused to leave, and apparently launched a disguised movement that incited violence and created crude battle scenes for the world to watch. Yet for the number and resilience of protestors, for the camaraderie it inspired throughout the Arab world, for the surprising indignation of a people accustomed to bow down from the time Pharaohs commanded them to build the pyramids, this past week was charged with momentousness and seemed to articulate a longing for a new world order. Is there one awaiting us? Who knows. Egyptians, and inspired fellow Arabs, may emerge from this crisis feeling more empowered, even if they don’t reach political aspirations, yet feeling proud of their own stand. These mass movements could increase social ownership, forge a mid-course of political representation and reduce the perceived polarization against the West, which could in turn weaken extremism and the lure of terrorist action. The century born out of 9/11 could be less polarized after all, and genuine democracies could flourish in the Middle East, after the war-forced ones failed. Maybe the 2022 World Cup in Qatar could celebrate the coming-of-age of a renewed, more empowered and more peaceful Arab region, standing tall like Dubai’s skyscrapers, like the 1990 World Cup celebrated the end of the Cold War and 2008 Beijing Olympics cemented China’s forestage position. Or the scenario could not be as rosy, who knows. But one benefit those of us far from Cairo have already felt. A curious feeling developed inside many following the protests, a surprising, yet benevolent, reaction: empathy. We have appreciated the cause of the people; we could visualize the dissatisfaction with their government; we have been amazed by the resilience and courage of the crowds; we have followed the news and hoped the crisis would finish. It is a surprising feeling because many of us have not seen the world out of Cairo before; those people on the street were them, a very distant them. Empathy brings a good shake-up of our prejudices. It warms the iciest polarization, when we see the human face on the other side. It helps us recognize beauty and character and humanity we would not expect. It also helps us recognize God better, because when he came to be with us, it wasn’t the safe Jesus we would expect. It was a Palestinian, probably darker-skinned, Aramaic-speaking Jesus, someone we would probably avoid and cross the street to the other curb side, if we saw him today. It was a strange Savior, a foreign person, with a subversive rhetoric. We could reject him simply out of prejudice, if empathy did not teach us to look in strange places, and to be taken by unexpected humanity, and to let God appear as he may, even while we long so hard to make him look and act like we do. I appreciate your suggestion of the Culture of Empathy website. It looks a very interesting initiative. Empathy is indeed one the largest values we need today, and one which enriches us tremendously.